I felt safe leaving my crappy, cheap bike chained right in front of the Police Station in the busiest part of the town in the middle of the day. Yet, to my surprise, after spending 5 minutes in the local council building my bike disappeared. From what witnesses have described the whole thing looked like a scene from a robbery film. A van, two hooded men jumping out, one cuts my cheap bike lock with some kind of petrol grinder, the other one runs with it to a van, and off they go. It didn’t even take them one minute to execute this Ocean Eleven Heist plan. And all these for what? £200 Halfords bike? F…me, who would expect this? Still, I had hope. I walked into the Police Station and reported robbery literally within 5-10 minutes of the incident. With a bunch of CCTV around the place, witnesses, registration numbers of the van involved, I simply hoped that Police will get my bike back within an hour. Unfortunately, the thieves were too good, or maybe my bike wasn’t expensive enough to be worth Copper’s effort :) What did I expect? The whole London Police to be on the lookout for the van with the stolen bike? After 2 months I was informed that they can’t do anything else for me. However, they offered me help with some kind of Post-traumatic stress. WTF ? Don’t be deluded, they will take anything and break into anything. 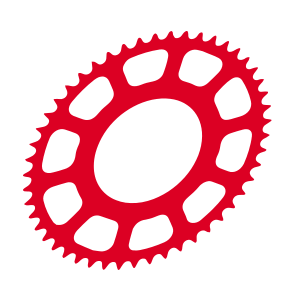 The only way that will almost guarantee your mountain bike’s or any other bicycle’s safety is when you keep it inside your house above your bed :) Freezing, cutting, lock picking… For determined bike thieves who know their jobs, there is no deterrent or lock that can’t be broken. But even though your bike is never 100% safe, you can take a few precautions and make the thief’s operation harder and longer. Choosing the best bike lock will be one of the most important decisions, however, before we review best bike locks for your bike, let’s take a look at a few tips on how to lock it. I assume we are talking here about low-end, cheaper bikes, maybe mid-range bikes in some exceptional situations… you are not thinking about leaving your 4K Enduro bike chained in some part of the London, right? Location: Choose a busy location well covered by CCTV and with lots of people walking past. Also, consider locking your bike in places that don’t indicate you being away from your bike for a significant amount of time (cinema, theatre). Object: To lock your bike choose an immovable, metal object that can’t be easily unscrewed or dismantled. Cemented into the ground specially designed bike racks are the best. Lock The Frame: Always lock your frame, not the wheel. As much as it sounds obvious, it happens all the time. A thief simply removes the wheel and walks off with the rest of the bike. Keep The Lock off The Ground: If it’s on the ground, it’s easy to smash the lock against the hard floor or use it for added leverage with a bolt cutter. Avoid The Top Tube: Less smart thieves will be tempted to use the frame as the leverage to try to break the lock despite the fact that it can damage the frame. If possible keep the lock high up around the down tube. Make IT Tight / Use Mini Locks: The most common way to break the better D-locks / U-locks is to use a bottle jack which can be inserted into the space inside the U. That’s why fitting your lock in the way that doesn’t leave much room inside, or using Mini D-locks / U-locks make sense here. It will make it very difficult or impossible to lever or get any sort of levering tool inside the shackle. Key Whole Facing Downward: This way you will give a thief hard time to tamper with the locking mechanism. Don’t skimp on it. It probably will be the worst decision you can make. But the price won’t be the single factor that will determine the quality of your bike lock. Weight, design and other bells and whistles can make it more expensive but not necessarily best for the job. If you are looking for a fancy chain that fits around your waist, you won’t find here anything for yourself. We are going to focus here strictly on security regardless any other features that will make your life more comfortable. From my own experience using multiple Stiff D-locks or if you prefer U-Locks devices, and securing them in the way that they are hard to be moved about, means the thief’s bolt cutters will be very hard to get around them. I’d never use a cable lock again, even chain locks are too easy to snip. 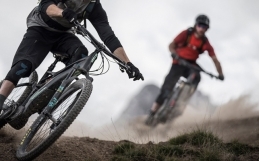 Here are 5 best bike D-Locks to secure your mountain bike. 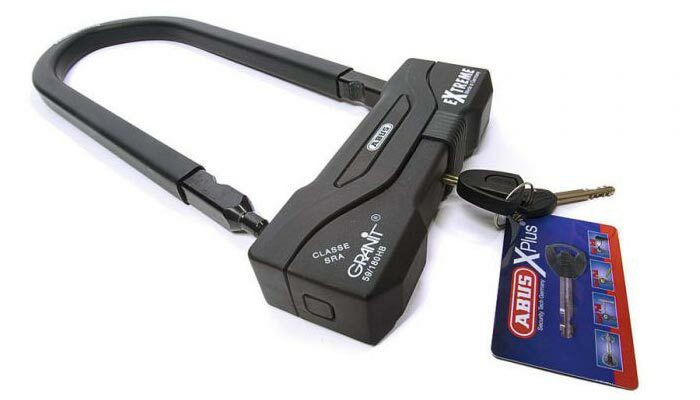 With a tensile resistance that can handle a couple of vans pulling it apart, Abus Granit Extreme 59 is one of the best bike locks to protect your mountain bike. 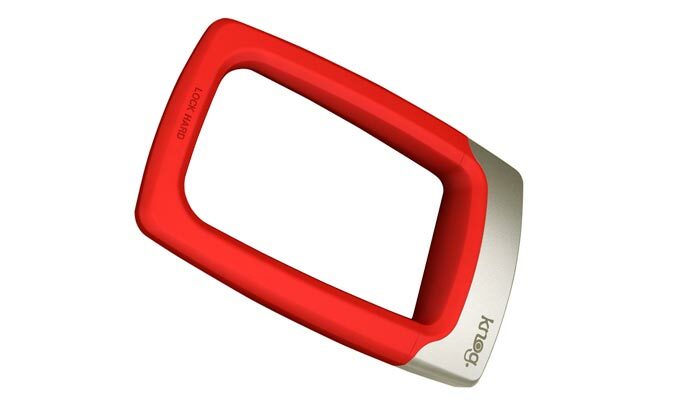 It’s arguably (touted by Abus) the toughest D lock money can buy. Other tests give it excellent scores in torsional resistance, weather resistance, bolt cropping, and its resilience against picking. Using another key to open this lock won’t be possible since its mechanism features more than 1 million key combinations. A double locking mechanism also means that it will have to be cut twice to remove the lock. You would need 2 minutes and a grinder in order to cut only through one side. “An interesting fact is that this lock is developed to destroy a disc blade before it can cut through.” It’s not cheap, but if you prize your bike, it might be worth its money. 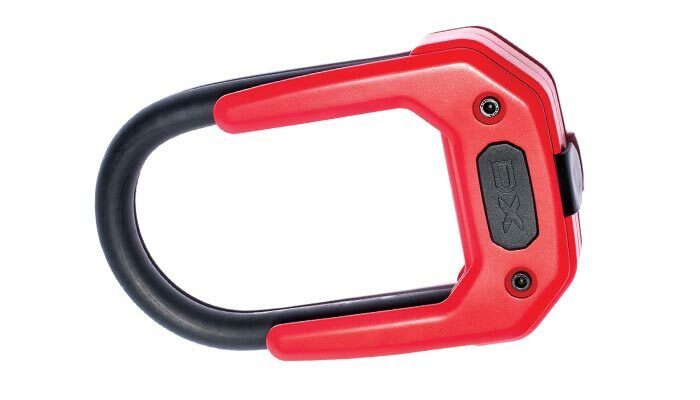 18″ shackle, triple heat-treated Kryptonites MAX-Performance steel, the double bolted crossbar locks on both ends of the shackle (it will need to be cut twice), over-sized hardened steel crossbar which renders leverage attacks quite useless. It’s one beast of the locks. It’s smaller size also means that if you lock your bike correctly, a thief won’t be able to insert a hydraulic bottle jack that could pop the lock open. No bolt cutters will be able to crop this lock. A thief can only defeat this bike lock with a portable angle grinder which will take upwards of 5 minutes to get through one side. 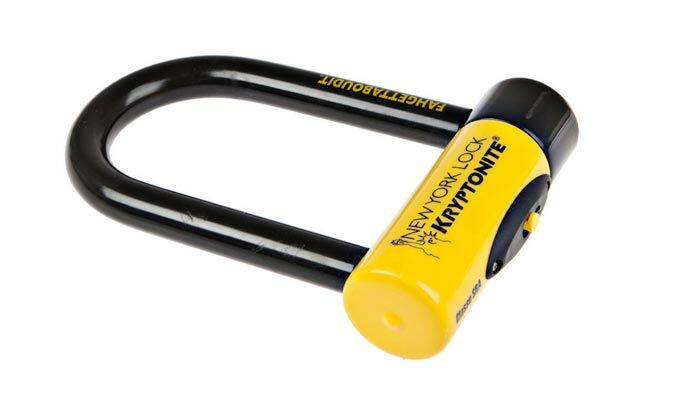 It’s the thickest, one of the heaviest, and undoubtedly one of the most secure and best bike locks. In fact, manufacturers are so sure of its performance that The Fahgettaboudit is eligible for coverage by Kryptonites in-house Anti-Theft Protection. If someone defeats this bike lock and steals your bike, depending on the value of your bike, Kryptonite will pay you up to £2,500 ($4,500). 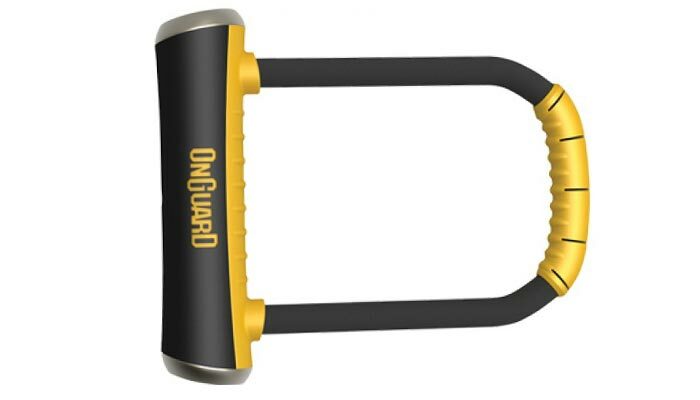 The ONGUARD claims many of its products to match the design and security of the best bike D-Locks at the half price. The 16 mm thick U shackle of the ONGUARD Brute STD makes it another super strong and one of the most difficult locks to cut through. It also features the X4P Quattro mechanism which secures the shackle to the crossbar in four places maximizing strength to resist jacking, prying, pulling and twisting. Cutting through the shackle will take in close to two minutes which is not bad considering the price. Brute STD lock is validated by its Gold rank on the sold secure rating system and is considered as one of the most secure locks on the market. ONGUARD also offers their own “anti-theft protection” for Brute STD. 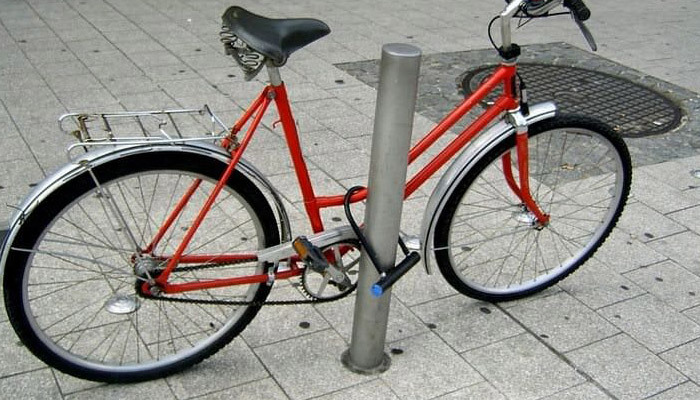 With excellent weather protection and rating of the Sold Secure Gold, this bike lock is built to last. HIPLOK DX is also a very tough opponent when it comes to twisting, sawing and grinding forces. Not as good as its competitors in tensile test, but being able to withstand 28kN of the pull forces, HIPLOK DX is also more than capable to see off the most of compact, portable bottle jacks. On the bad side, its short length and small internal dimensions might make it hard to secure some bikes to bigger objects. Otherwise, it’s an excellent bike lock for a decent price tag. 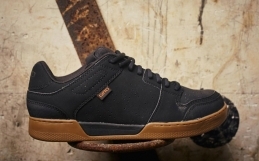 Australian bike accessory brand boasts the Strongman as having a ‘Ghetto’ security rating. A double lock mechanism and Sold Secure Gold rating comfortably make this lock yet another of the most secure and best bike locks. In power tool test the shackle takes only over 30 seconds on each side to cut through. However, considering that the thick silicone coating melts and gums up an angle grinder or any other saw, and it requires at least a minute of hacking away with a Stanley knife on each side, all these add up to a little tough cooky to break. The silicone coating will also need to be taken away to get a set of bolt croppers around it. Same as with HIPLOK DX and KRYPTONITE FAHGETTABOUDIT MINI, its fairly compact dimensions have advantages and disadvantages. 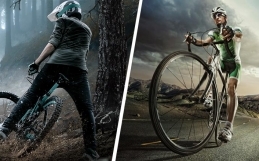 Some bikes and mountain bikes with deeper tube shapes or deep-section wheels might be hard to secure to some objects. A very sad story you have shared! By the way, the 5 best bike locks you have written a review is so helpful for us. But I would like to say that, Kryptonite is the best I think. What is thought of you?